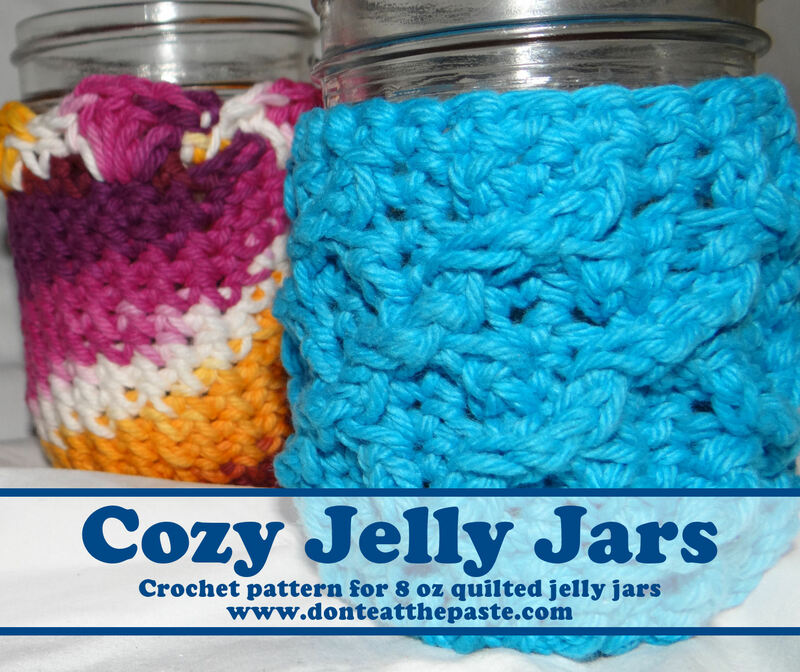 So lately I'm crocheting cozies for jelly jars- because they look so cute all dressed up. It would also be a nice way to share a spice mix, you could use it with a Cuppow for a small drinking jar. These patterns are sized for the half pint quilted jelly jars with the regular mouth by Ball Canning. Both jars use a size G hook and worsted weight yarn- I like Lily Sugar 'n Cream very much for these sorts of projects and you can see how the Batik color way created a spiral effect on the jar in back. This cozy has a simple front post stitch design that makes a diamond grid in textured stitches around the jar. If you haven't tried front post crochet- it's done by inserting the hook around the post of the stitch instead of in the top of the stitch. Front post means it's done on the front or outside of the piece. Round 1: sc 7 times in ring or first stitch, sl st to join. Round 5: ch 2 (counts as first stitch), dc in next st, dc in each stitch around. Sl st in 2nd st of starting chain to join. This is where it gets tricksy. You'll be working backwards and forwards to create the Xs. Round 9: Ch 1 (does not count as first stitch), sc in same st, fptc in last dc of previous round, skip stitch, sc in next st, skip stitch, fptc in next dc, *sc in next st, skip stitch, fptc in skipped dc, sc in next stitch, skip stitch, fptc in next dc*, repeat ** around- the last fptc will be going into the first skipped dc. sl st to join. Round 14: Ch 1 ( does not count as first stitch), sc in each stitch around, sl st to join, break off yarn and weave in ends. Round 5-16: Ch 1 (does not count as first stitch), sc in first stitch, sc in each st around, sl st to join. Round 18: Ch 1 (does not count as first stitch), sc in same stitch, skip stitch, 5 dc in chain 1 sp, *sc in next st,skip stitch, 5 dc in chain 1 sp,* repeat ** around, sl st to join. (7 shells)- break off yarn and weave in ends. Hope you enjoy dressing your jelly jars!